Holyrood authorities have admitted that repairs to the roof of the debating chamber may require a long-term move to temporary accommodation. It also emerged the makeshift chamber in The Hub on the Royal Mile will be stripped out this weekend for a prior booking and re-installed next week. To complicate matters further, the building is not available for use in the week beginning Monday, 20 March. Engineers are still unable to establish why a roof beam suddenly became loose. A Scottish Parliament spokeswoman confirmed that The Hub had been booked for parliamentary business next week. But she said that in the absence of further information from the parliament's structural engineers, no decision had been taken as to whether a contingency venue would be required after this. She added: "However, we are reviewing our long-standing contingency plans for other venues around Edinburgh beyond this timeframe as The Hub is not available for the week of 20 March." It has cost the parliament £20,000 to hire The Hub for this week - not including extra broadcast, administrative and electronic voting system costs. The spokeswoman said: "We cannot speculate on overall costs for contingency plans until the situation is resolved." 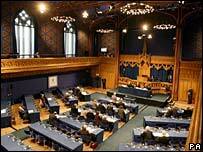 Scottish Conservative leader Annabel Goldie suggested that Holyrood officials should look at the possibility of creating a makeshift chamber elsewhere in the parliament building.